The beta Pet Journal is absolutely overflowing with new pets, many of which are currently labeled as wild. There are different moths, fireflies, and crabs among other pets you can encounter while traveling in Draenor. Other additions include pets purchased from vendors and require Revered reputation with certain factions. One such pet is Son of Sethe (pictured right) from the Outcast Arakkoa, our first wind serpent companion! There are two new dropped pets — Bronze Whelpling and Eye of Observation (pictured below). The whelpling can be obtained from the Iron Horde during the level 90+ event in Blasted Lands, and the eye can be looted from Oromo the Observer in Talador. Multiple quests will have pets as rewards, but two can only be obtained by building an Inn in your garrison. Once built, the Inn will receive visits from special NPCs each day, and they will offer players a daily quest. Keep your eye out for two specific visitors, Mylune and Cowled Ranger. Complete a task for them and you'll receive an Everbloom Peachick and Sentinel's Companion. Enjoy tinkering with toys and trinkets or bending metals into weapons and armor? Two new pets will be available via Engineering and Blacksmithing, the Mechanical Scorpid and Soul of the Forge (pictured right). It's unknown where the schematic for the scorpid will come from, and it's still a mystery how Blacksmiths will obtain this molten pet. The patch added many more new pets, as well as updates to previously datamined companions. These updates include renames and changes to how the pets can be acquired. We've included all of this information in our ever-growing list of WoD pets, so check it out! Collectors rejoice, an achievement to collect 600 unique pets is on the way! So. Many. Pets. 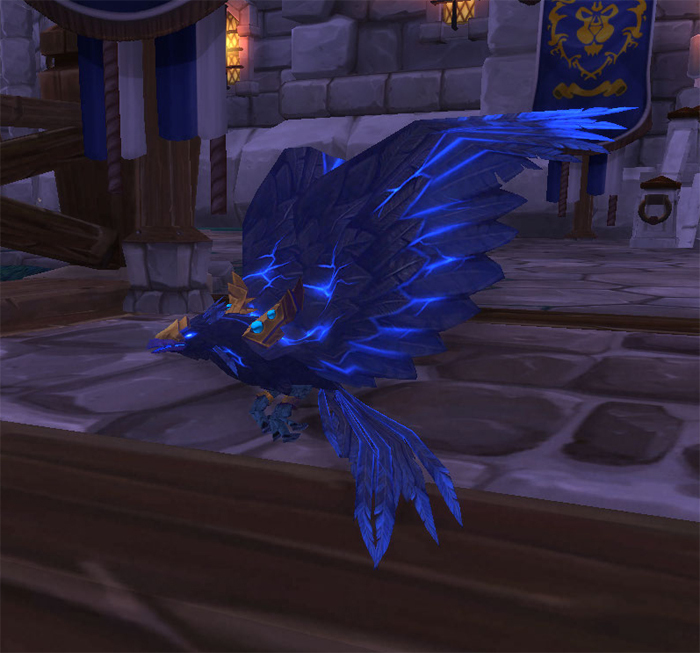 rewards a pet that was implemented in a previous beta patch, Stormwing (pictured right). Another notable achievement for collectors is a Feat of Strength. Get your PVP gear ready — Victory in Hillsbrad requires a victory in WoW's special 10th anniversary event, the Southshore vs. Tarren Mill battleground. Should you come out victorious, Hogs might just deem you a worthy champion and join your army of pets! Last but not least, earning Gold in all of the Draenor Challenge Modes with your guild may unlock a pet for you and your guildmates. The achievement Challenge Warlords: Gold - Guild Edition seems to be incomplete at the moment, and the pet reward is not specified yet. We'll have to wait and see what reward awaits those that conquer Challenge Modes! Six new Pet Battle trainers can now be found in Draenor, one in each zone (not including Tanaan Jungle). One NPC might sound familiar; Cymre Brightblade is the tribute NPC to avid WoW player and blogger, Cymre Jones! Players can challenge these NPCs to a Pet Battle and complete their daily quests. For your efforts you'll be rewarded with Pet Supplies, and inside you'll find the new currency Pet Charms, plus one of the new leveling battle-stones. Before you storm into Draenor to take on these new trainers, you'll need some prior Pet Battling experience. According to developer Jonathan LeCraft, you'll need to have completed some of the previous trainer encounters prior to the six in Draenor. @perksnpeeves They will eventually be prereq'd by the 1-20 trainer quests, to make sure you aren't stumbling into death, but that's it. These six new trainers only have teams consisting of rare quality level 25 pets, however Cymre has a special team of legendaries. Perhaps some extra training for your pets to prepare for Draenor wouldn't hurt! As of the current build, and according to going to the WoD version of wowhead, and selecting tameable pets, there are just over 100 new pets that have been added and are obtainable in WoD. 600 uniques were possible before, 608 even. and as far they have not increased the total amount of pets you can have in your journal. I would be surprised if there will be less than 700 uniques possible after WoD. I just spent the better part of an hour over on wowhead looking at all of our new editions to the pet journal. I am really looking forward to the garrison, but with all this pet battlin' I am going to be doing, when will I have the time? Okay Blizz, you've given us hyena furries as a pet, where are my quad hyena pets?! @Fib, TheCrafticus already said they're not for legendary stones, just for leveling stones.